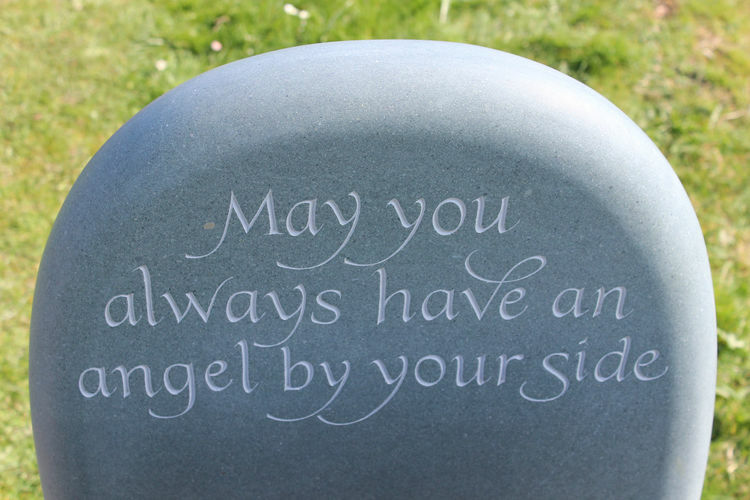 This is a selection of poems, readings and quotes to give comfort and support to anyone who has lost a baby to stillbirth, miscarriage or any other illness. As a mother, my heart breaks when I compile this list, but we have many clients who come to us deeply bereaved and are so grateful for the information they have found on our blog, and I hope that this list of poems and quotes may not only provide some small amount of comfort but may also provide ideas for an epitaph or headstone quote. It is always worth waiting at least a year before even thinking about a memorial, and often several years will go by before you are able to face the idea of commissioning a memorial. Do not feel hurried, take your time, and be kind to yourself. There is an emotional and beautiful video made by a couple who lost their stillborn daughter here. have stayed, we feel so lucky to have seen it. Wherever they go, and whatever happens to them on the way, in that enchanted place on the top of the forest, a little boy and his bear will always be playing. When you are sorrowful look again into your heart, and you shall see that in truth you are weeping for that which has been your delight. A moment in our arms...a lifetime in our hearts. At midnight she was there; she went as daylight shone. Just got her set of wings. As she steps through heaven's gate. They all lined up to greet her. And takes her special place. With the biggest kind of love. And more peaceful than a dove. There is sorrow down below. Since they had to let her go. These are my footprints, so perfect and so small. These tiny footprints, never touched the ground at all. Not one tiny footprint, for now I have my wings. These tiny footprints were meant for other things. You will hear my tiny footprints, in the patter of the rain. Gentle drops like angels tears, of joy and not from pain. You will see my tiny footprints, in each butterflies' lazy dance. I'll let you know I'm with you, if you give me just a chance. You will see my tiny footprints, in the rustle of the leaves. I will whisper names into the wind, and call each one that grieves. 'cause even though I'm gone now, we'll never truly part." The mention of my child's name may bring tears to my eyes, but it never fails to bring music to my ears. If you are really my friend, let me hear the beautiful music of his name. It soothes my broken heart and sings to my soul. Fingerprints that teach me about caring. Fingerprints that teach me about love. Fingerprints that teach me about courage. Fingerprints that teach me about hope. Fingerprints that bring me closer to my loved ones. Fingerprints that bring me closer to myself. All this from tiny fingerprints that touch my heart. You will live in my heart forever - never to be forgotten. I've loved you from the start. God chose that I move on. What you are forced to face. Or make your heart not ache. That I am always there. That doesn't mean I never "was"
A million times we've cried. No one else will ever fill. you were a special child. to be with us awhile. and made our life complete. was far too short, but oh so sweet. you're with the angels up above. Or even pause to wonder if the petals fall too soon. Were swiftly here and gone. Sit with me for awhile. And see your tender smile. Why you have gone away? Why is it, you couldn't stay? And that I love you so." And I'll be waiting when we meet again. But right now, God needs you more. That pale white brow so fair. You will always be to me. Just as you were meant to be. And all that it would be. We waited and longed for you to come. To laugh, to rock, to wiggle. And listen to you giggle. He’ll always be your dad. The child that we had. There’s love in every tear. And yet will have forever! of laughter light about her lips. of daisies for her soft hairs crown. ours the winter of her going. A million times we have cried. You would have never died. That none will ever fill. this cord can't be seen by any on earth. the invisible cord from my child to me. it can't be destroyed it can't be denied. a mother and child, death can't take it away!! Still walking in a present of our own. The child was a gift. The grief does not smother the gratitude. And death..is not the end. We grieve, but not as those who have no hope. Yet none says that since death is not the end, we should not grieve. Though grief does not smother hope, neither does hope smother grief. but the hardest is not being with you. But holy death is kinder? Their journey has just begun. From the sorrows and the tears. In the hearts of those they touched. And they were loved so much! Until we can join them when our lives are done. Till our tales are all told and our tears are all shed. Where the sun shines so brightly no sorrows remain. Just love - Only love - In your lifetime. I have to answer truthfully. The loss of a loved one is like a major operation. As years go by, we manage. But the pain is still there, not far below the surface. seems as though a knife were in the wound again. the pain of grief is the price we pay for love! We were not prepared for this. Where always you will be. Our hearts will always grieve. For I am one with these. Among those I call "friend." Because I love those, too. Weep not for me, though I be gone. I shall not really die. How very softly you tiptoed into my world. but she did not go alone. the day He took her home. We mortals sometimes question the wisdom of His love. The saddest word mankind knows will always be "Goodbye." Must realize God loves children, Angels are hard to find. Sometimes when one person is missing, the whole world seems depopulated. And can it be that in a world so full and busy, the loss of one weak creature makes a void in any heart, so wide and deep that nothing but the width and depth of vast eternity can fill it up!